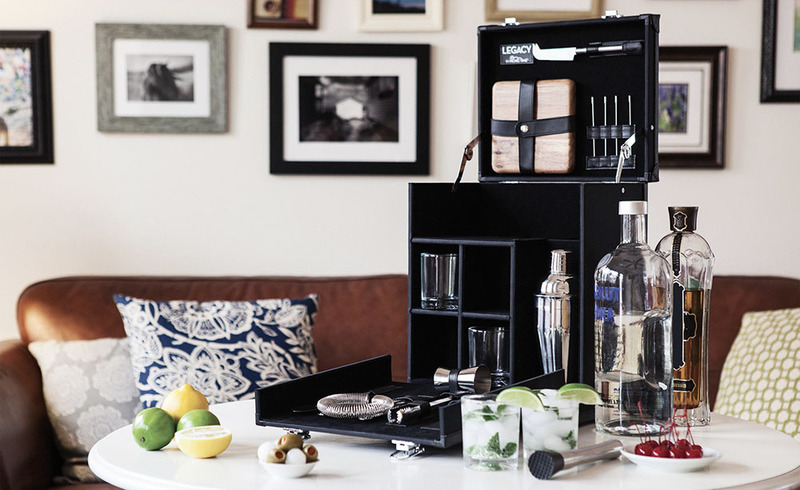 The Hamilton Travel Bar consists of the travel case and 16 essential tools, enough to serve four people at one time. The case is big, measuring 14’ by 10.5” by 10.25”, and heavy, coming in at almost 18 lbs with all the accessories/tools inside and no bottles. A heavy duty comfort grip supports this immense weight; while this handle doesn’t make the case any lighter, it does ensure you won’t drop it unexpectedly. Attractive ballistic nylon with leatherette accents covers the exterior, giving it that “roaring 20s” look the product description mentions. Luxurious velveteen layers the interior to cushion and protect the more fragile elements of the bar. The knife, board and cocktail sticks fit in specially designed slots in the lid. The shaker has its own place beside the glasses, while the muddler, tongs, strainer, stirrer and jigger fit on the front panel. This front panel opens up to allow easy access to the interior. Finally, all of the panels are removable, so you can get to the things you need quickly. This works quite well and makes for some handy construction. Unfortunately, this travel bar isn’t perfect. The biggest “con” we found is that there is no bottle opener or corkscrew in the case! One of the most essential pieces of a cocktail kit, and it’s missing. You can throw one in there though, for good measure. The glasses and knife are of a cheaper quality than anticipated. Though, if you have lowball glasses of your own, they will fit into the space provided and easily fix that issue. Same goes for the knife, which is quite dull. The space for the bottles fits only standard sized wine bottles (or equivalent); so you will need to tote along any specialty bottles. Finally, the clasps and closures leave a lot to be desired. There is no lock, so you can’t set your Travel Bar down in public and enjoy your picnic. And the clasps can be faulty. When we looked online to see what other consumers thought about the Travel Bar, we found several reviews from people who received their case with broken or missing clasps. A big disadvantage for an item made to travel.